The stories about Miss Conway Lea continue to be enjoyed by those who check out my journal entries on my website from time to time. Recently I heard from a lady who used to live in Livingston, but is now a resident of Bowling Green, Kentucky. Her name is Jolene (Sells) Christian (no relation to my husband as far as we know). She contacted me by email and wanted to share with me a story about Miss Conway. She begins by telling me how she and her husband got to know Miss Conway. Sometime during the year 1958, Mrs. Christian and her husband, Wales, had gone to the home of Clarence and Mary Blanche Davis to talk to their oldest son, Tom, about the possibility of getting him to do some taxidermy work. I understand from Tom’s sister, Jane, that Tom had taken a correspondence taxidermy course by mail. He became very good at this, and included in the many birds and animals he mounted was a beautiful and delicate little hummingbird. Jane also told me that their Mamma Davis often helped Tom with his taxidermy work. And it was the discovery of a dead bird found near the Christian family pond in the Allons community that brought Wales and Jolene Christian in search of Tom Davis. Mr. Christian believed the bird he found was a pelican (something that would definitely be unusual in our area). Mrs. Christian told me her husband was quite knowledgeable about birds, and studying about them was something he very much enjoyed. There were no marks that would indicate how this particular bird died, and because Mr. Christian thought it would make a very beautiful mounted specimen, he and Mrs. Christian went to seek the help of Tom Davis. When they arrived at the Davis home, Miss Conway happened to be visiting too. An interest in birds was something Miss Conway and Mr. Christian learned they had in common during this visit. But it was only after Miss Conway determined that Mr. Christian had not killed the bird himself, something she definitely would not have approved of (as Joe Davis knows about firsthand), that she invited Mr. and Mrs. Christian over to her home to see her bantam chickens. During their visit in the Lea home, Mrs. Christian said she and her husband were amazed to see that Miss Conway had a little bantam chicken that nested in the fireplace of her home. They were also shown many artistic projects Miss Conway had throughout the house. Mrs. Christian remembers very vividly that Miss Conway had been working on an oil cloth that was spread over a table on which she was in the process of painting beautiful flowers across. There were other paintings of various sizes displayed around the house, some that had been done on cardboard and some that had been painted on other surfaces too. While they were discussing Miss Conway’s artistic abilities, Mr. Christian inquired of Miss Conway about the possibility of her painting an old oil lamp that had been his mother’s since 1898. She agreed to do the lamp, and on May 22, 1958, she wrote to Mr. and Mrs. Christian to advise them she was ready to begin the project. The beautifully artistic handwritten letter she wrote is included in this article. Notice first of all the salutation in the letter "Kind Friends". And next, the detailed packing instructions Miss Conway gives Mr. and Mrs. Christian. But most interesting of all to me is the P.S. on the bottom of the letter where she tells them to "be careful in being with, or among the measles - for I have never had them, to have them might mean death for me." Miss Conway Lea's artistic abilities are still evident on an antique lamp that has been in the Wales Christian family since 1898. 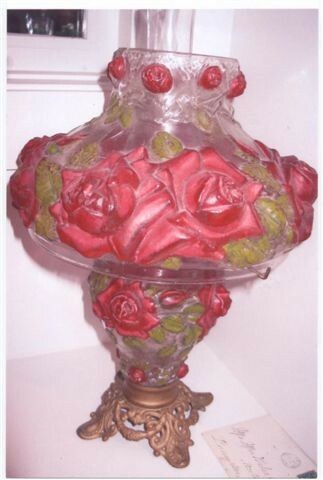 The painting of the lamp was completed by Miss Conway, and today it is in the home of Jolene Christian’s daughter. 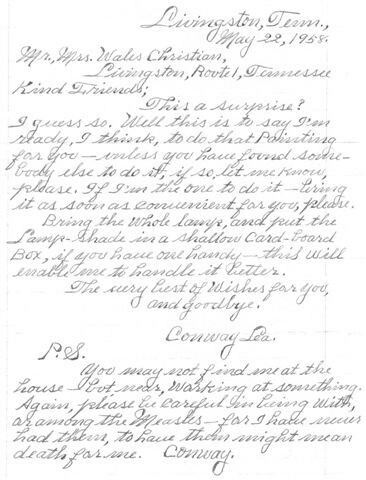 That handwritten letter of Miss Conway’s speaks volumes concerning how the traditions and everyday courtesies that were so evident in Miss Conway’s life have somehow gotten misplaced in our world today. It would be hard to begin to compare any email sent or received today with the eloquent letter sent to the Christians by Miss Conway. The well mannered upbringing and politeness of Miss Conway stands out quite clearly in her letter. This particular way of communicating between two people is slowly becoming just another lost art. And as I close this chapter of my journal, I feel certain Miss Conway’s wouldn’t mind if I borrowed the words she used to end her letter . . . "The very best wishes for you, and goodbye." 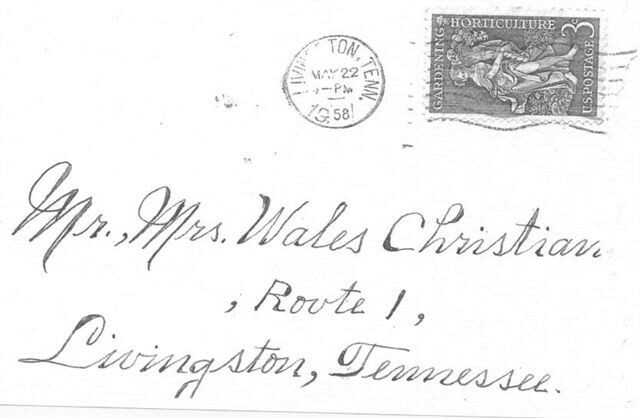 The beautiful artistic handwriting of Miss Conway Lea is not often seen today. The beautifully addressed envelope bears a three cent stamp.